First coming to College of the Mainland to take two six-week welding courses, Harrington, a former plumber and construction worker, discovered at last a career he could enjoy for the rest of his life. It proved a second chance for Harrington, who holds two nonviolent felony convictions. Though he has not yet completed COM’s four certificates, he has passed an industry welding test. He’s thrilled to make $1,000 a week working at Woven Metal Products in Alvin, welding various types of reactors used in industry. 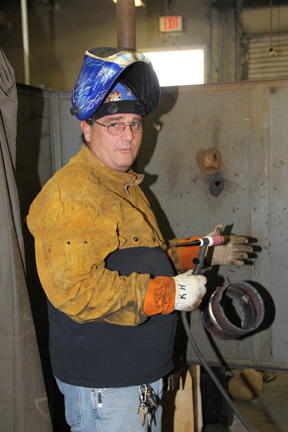 COM welding professor Doc Miller has seen many such transformations in his 20 years teaching. A booming industry, welding provides a second chance for students of all backgrounds. Harrington, though now employed, has determined to earn all four certificates COM offers – Entry-Level Welding, Entry-Level Gas Shielded Pipe Welding, Entry-Level Shielded Metal Arc Pipe Welding – and expand his skills. Harrington learned through textbooks, hands-on instruction and as many hours practicing in the lab as he wanted. Many students, like Harrington, qualify for financial aid. COM is an approved vendor to provide vocational training for eligible participants under the federal Workforce Investment Act. Qualifying individuals can receive free tuition, fees and books. Working with instructors Miller, Rico Brown and Victor Woods, Harrington has found his niche. For more on COM's Welding Program, visit www.com.edu/welding.